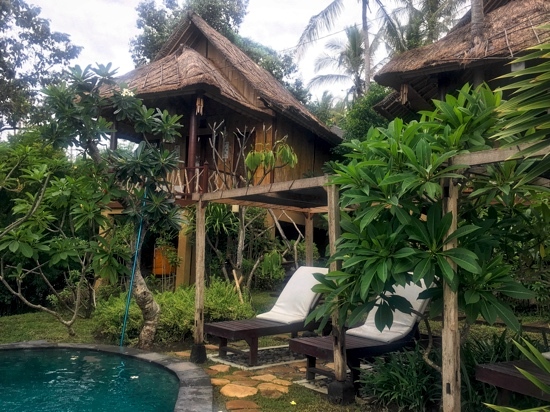 Tucked away in a hillside village beyond Candi Dasa, Jepun Didulu’s four cottages are surrounded by a beautiful tree-filled garden. Three of the four cottages are fan-cooled. Perched on stilts, they are traditionally constructed from wood, bamboo and thatch. The fourth air-con cottage is made from more contemporary brick and tile. 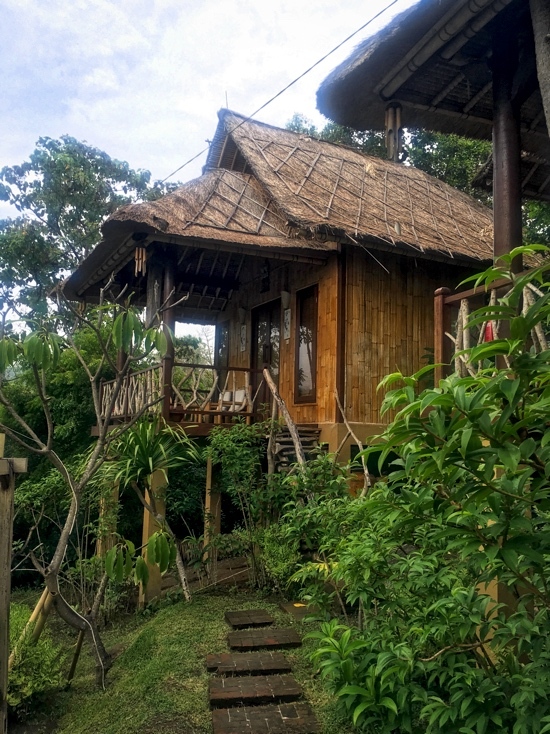 We recommend the more charming bamboo cottages unless you really need air-con. Average rating 8.5 from 70 reviews. 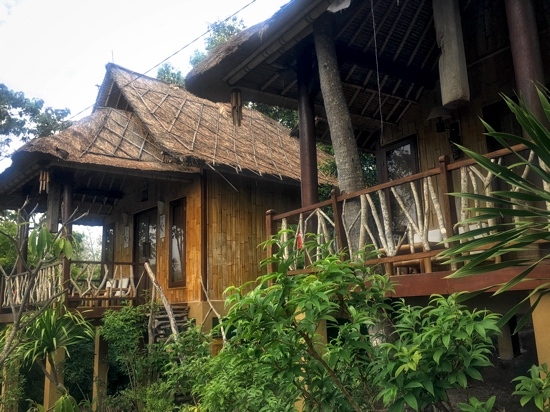 The spacious, airy bamboo cottages are furnished with a comfy bamboo bed with mozzie net, bamboo table and chairs and bamboo wardrobe — see a theme here? Beautiful rough-hewn wooden floors and a high thatched roof add to the tropical ambience. A wood and rattan ceiling fan, bamboo lampshades, bedside lamps and decorative wooden carvings polish off the look. More modern amenities include a flatscreen TV and free WiFi throughout. Each of the bamboo cottages has a small but functional local-style kitchen, good for simple self-catering. The air-con room doesn’t have one. The ensuite hot-water bathroom is outdoor-style with a bath tub and small lush garden within black volcanic stone walls; be warned that there are some reports that there isn’t enough hot water to fill the tub. A wide balcony overlooks the landscaped garden, small swimming pool and beyond to the ocean. Railings and stairs are fashioned from tree branches, and one cottage has a coconut tree growing right up through the middle of the balcony and roof. Balconies have bamboo table and chairs for relaxing, and plenty of space — a couple were practising yoga on one when we visited. The cottages are spotless and well maintained, which can be difficult using natural materials in the tropics. A small organically shaped swimming pool has shaded sun lounges, and views out to sea. Garden paths are steep and a bit slippery, but it was the wet season when we visited. Breakfast is included and simple meals can be prepared by the family. 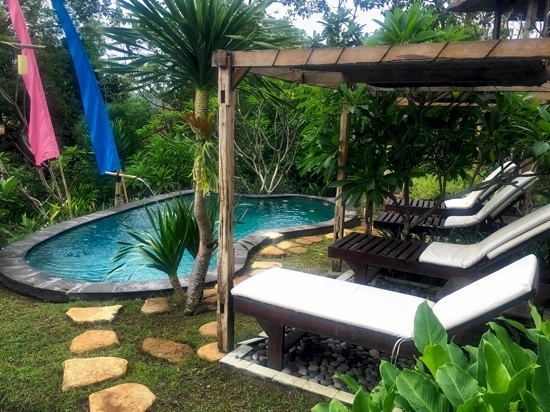 Jepun Didulu is just far enough off-the-beaten-track to be peaceful, but close enough to get to Candi Dasa for a night out. The beach is within easy reach, and staff can drop you off for the day. This is a great spot for flashpackers to experience village life and local hospitality or use as a base to explore East Bali. To find Jepun Didulu, continue over the hill from Candi Dasa, and watch out on the left for Milan Ceramics. Turn left at the next corner. Jepun Didulu is signposted at the turnoff. From Amlapura, turn right 120 metres beyond the signposted turnoff to Virgin Beach. Check rates at Jepun Didulu on Booking.com. Room: Standard double room, low season: 500,000 rupiah, high season 500,000 rupiah. Notes: Fan-cooled. Air-con: 600,000 rupiah.